In the Catholic Church history, when, why, and by whom did the four living creatures become associated with the four evangelists? The second century church father Irenaeus was probably the first. Against Heresies: Book III Chapter XI-Proofs in Continuation, Extracted from St. John's Gospel. The Gospels are Four in Number, Neither More Nor Less. Mystic Reasons for This. It is not possible that the Gospels can be either more or fewer in number than they are. For, since there are four zones of the world in which we live, and four principal winds, while the Church is scattered throughout all the world, and the “pillar and ground” [ 1 Tim. iii. 15. ] of the Church is the Gospel and the spirit of life; it is fitting that she should have four pillars, breathing out immortality on every side, and vivifying men afresh. From which fact, it is evident that the Word, the Artificer of all, He that sitteth upon the cherubim, and contains all things, He who was manifested to men, has given us the Gospel under four aspects, but bound together by one Spirit. As also David says, when entreating His manifestation, “Thou that sittest between the cherubim, shine forth.” [ Ps. lxxx. 1.] For the cherubim, too, were four-faced, and their faces were images of the dispensation of the Son of God. For, [as the Scripture] says, “The first living creature was like a lion,” [ Rev. iv. 7.] 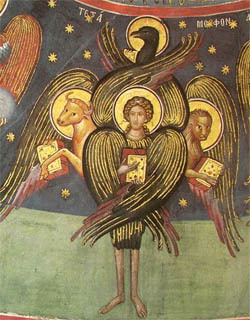 symbolizing His effectual working, His leadership, and royal power; the second [living creature] was like a calf, signifying [His] sacrificial and sacerdotal order; but “the third had, as it were, the face as of a man,”—an evident description of His advent as a human being; “the fourth was like a flying eagle,” pointing out the gift of the Spirit hovering with His wings over the Church. And therefore the Gospels are in accord with these things, among which Christ Jesus is seated. For that according to John relates His original, effectual, and glorious generation from the Father, thus declaring, “In the beginning was the Word, and the Word was with God, and the Word was God.” [ John i. 1.] Also, “all things were made by Him, and without Him was nothing made.” For this reason, too, is that Gospel full of all confidence, for such is His person. But that according to Luke, taking up [His] priestly character, commenced with Zacharias the priest offering sacrifice to God. For now was made ready the fatted calf, about to be immolated for the finding again of the younger son. Matthew, again, relates His generation as a man, saying, “The book of the generation of Jesus Christ, the son of David, the son of Abraham;”[ Matt. i. 1, 18.] and also, “The birth of Jesus Christ was on this wise.” This, then, is the Gospel of His humanity; for which reason it is, too, that [the character of] a humble and meek man is kept up through the whole Gospel. Mark, on the other hand, commences with [a reference to] the prophetical spirit coming down from on high to men, saying, “The beginning of the Gospel of Jesus Christ, as it is written in Esaias the prophet,”—pointing to the winged aspect of the Gospel; and on this account he made a compendious and cursory narrative, for such is the prophetical character. And the Word of God Himself used to converse with the ante-Mosaic patriarchs, in accordance with His divinity and glory; but for those under the law he instituted a sacerdotal and liturgical service. Afterwards, being made man for us, He sent the gift of the celestial Spirit over all the earth, protecting us with His wings. Such, then, as was the course followed by the Son of God, so was also the form of the living creatures; and such as was the form of the living creatures, so was also the character of the Gospel. For the living creatures are quadriform, and the Gospel is quadriform, as is also the course followed by the Lord. For this reason were four principal (καθολικαί) covenants given to the human race: one, prior to the deluge, under Adam; the second, that after the deluge, under Noah; the third, the giving of the law, under Moses; the fourth, that which renovates man, and sums up all things in itself by means of the Gospel, raising and bearing men upon its wings into the heavenly kingdom. Cherubim represented the seasons in other Ancient Near Eastern symbolism. Here is the reasoning of Victorinus in his commentary on the Apocalypse. I think he is the first to match the order you give. “And round about the throne were four living creatures.”] The four living creatures are the four Gospels. 7–10. “The first living creature was like to a lion, and the second was like to a calf, and the third had a face like to a man, and the fourth was like to a flying eagle; and they had six wings, and round about and within they were full of eyes; and they had no rest, saying, Holy, holy, holy, Lord Omnipotent. And the four and twenty elders, falling down before the throne, adored God.”] The four and twenty elders are the twenty-four books of the prophets and of the law, which give testimonies of the judgment. Moreover, also, they are the twenty-four fathers—twelve apostles and twelve patriarchs. And in that the living creatures are different in appearance, this is the reason: the living creature like to a lion designates Mark, in whom is heard the voice of the lion roaring in the desert. And in the figure of a man, Matthew strives to declare to us the genealogy of Mary, from whom Christ took flesh. Therefore, in enumerating from Abraham to David, and thence to Joseph, he spoke of Him as if of a man: therefore his announcement sets forth the image of a man. Luke, in narrating the priesthood of Zacharias as he offers a sacrifice for the people, and the angel that appears to him with respect of the priesthood, and the victim in the same description bore the likeness of a calf. John the evangelist, like to an eagle hastening on uplifted wings to greater heights, argues about the Word of God. Mark, therefore, as an evangelist thus beginning, “The beginning of the Gospel of Jesus Christ, as it is written in Isaiah the prophet;”[Mark i. 3. ] The voice of one crying in the wilderness,” [Isa. xl. 3. ] —has the effigy of a lion. And Matthew, “The book of the generation of Jesus Christ, the son of David, the son of Abraham:” [ Matt. i. 1. ] this is the form of a man. But Luke said, “There was a priest, by name Zachariah, of the course of Abia, and his wife was of the daughters of Aaron:” [ Luke i. 5. ] this is the likeness of a calf. But John, when he begins, “In the beginning was the Word, and the Word was with God, and the Word was God,” [ John i. 1. ] sets forth the likeness of a flying eagle. Moreover, not only do the evangelists express their four similitudes in their respective openings of the Gospels, but also the Word itself of God the Father Omnipotent, which is His Son our Lord Jesus Christ, bears the same likeness in the time of His advent. When He preaches to us, He is, as it were, a lion and a lion’s whelp. And when for man’s salvation He was made man to overcome death, and to set all men free, and that He offered Himself a victim to the Father on our behalf, He was called a calf. And that He overcame death and ascended into the heavens, extending His wings and protecting His people, He was named a flying eagle. Therefore these announcements, although they are four, yet are one, because it proceeded from one mouth. Even as the river in paradise, although it is one, was divided into four heads. Moreover, that for the announcement of the New Testament those living creatures had eyes within and without, shows the spiritual providence which both looks into the secrets of the heart, and beholds the things which are coming after that are within and without. For the Evangelists there have been used from very early times certain conventional emblems — a winged man or an angel for St. Matthew, a winged lion for St. Mark, a winged calf for St. Luke, and an eagle for St. John. All these are taken from the description of the heavenly liturgy in Apocalypse 4 and 5 must have been suggested by the vision of Ezechiel (Ezekiel 1:10). In the art of the early Middle Ages these emblems play a very prominent part. The four living creatures and twenty-four elders in Revelation? Was there any significance for the make of the tomb which was used to lay the body of Jesus? According to the Catholic Church, did Jesus fulfil the prophesy of Isaiah by being buried in a tomb hewn in rock? What, according to Catholic Church, does the name “Son of Man” signify?